Mix together flour, ground cinnamon, ground nutmeg, baking soda, and salt. Set aside. Layer ingredients in the following order into a 1 quart, wide mouth canning jar: Flour mixture, raisins, rolled oats, brown sugar, and white sugar. It will be a tight fit, make sure you firmly pack down each layer before adding the next layer. Attach a tag with the following instructions: Oatmeal Raisin Spice Cookies 1. Preheat oven to 350 degrees F (175 degrees C). Line cookie sheets with parchment paper. 2. Empty jar of cookie mix into large mixing bowl. Use your hands to thoroughly mix. 3. Mix in 3/4 cup butter or margarine, softened. Stir in one slightly beaten egg and 1 teaspoon of vanilla. Mix until completely blended. You will need to finish mixing with your hands. Shape into balls the size of walnuts. Place on a parchment lined cookie sheets 2 inches apart. 4. Bake for 11 to 13 minutes in preheated oven, or until edges are lightly browned. Cool 5 minutes on cookie sheet. Transfer cookies to wire racks to finish cooling. 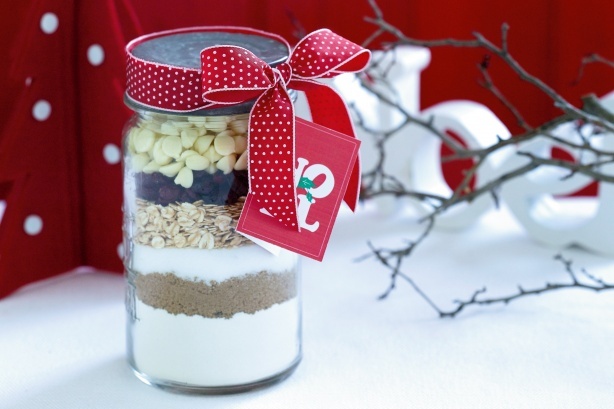 No comments for: "Cookie Mix in a Jar III Recipe"